Why do I need another Root Canal? 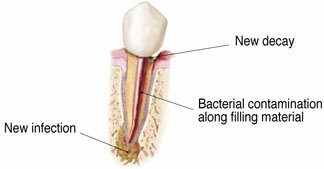 New decay can infect the entire length of the root canal system causing a new infection at the tip of the tooth. 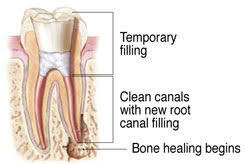 Blocked or Untreated canal space can harbor bacterial infection and lead to symptoms like pain and abscess if not addressed in a timely manner. If you still have a tooth you still can get decay. 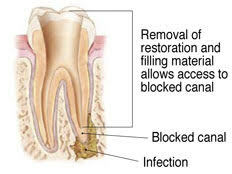 Removal of existing filling material, sealer cleaning the tooth and gaining access to the infected bone is necessary. For safety; a crown may need to be removed if a good seal, or proper isolation, cannot be accomplished while keeping the restoration intact. 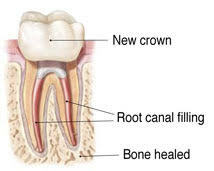 Additionally a crown may need to be removed to inspect the restorability of the tooth. In some cases the existing restoration can be left intact while accomplishing Re-treatment. Every scenario is different and must be fully explored to determine the safest most predictable way to allow for adequate healing following Re-treatment. Re-treatment is usually a multiple visit process spanning from a few weeks and in severe cases months. Calcium Hydroxide paste is placed in the canals to help the cleansing process. On completion Gutta Percha is placed in the newly cleaned canals sealing the toth from the infected bone. Questionable bone healing is addressed early in the process so that when the final filling material is placed you are on your way to predictable healing. Bone healing can take many months following Re-treatment. Follow-up should be scheduled to examine how well the bone has healed. In some cases bone healing is incomplete and additional surgical intervention may be necessary. When Re-treatment is completed a new restoration, or crown, is placed and the tooth is put back into use.